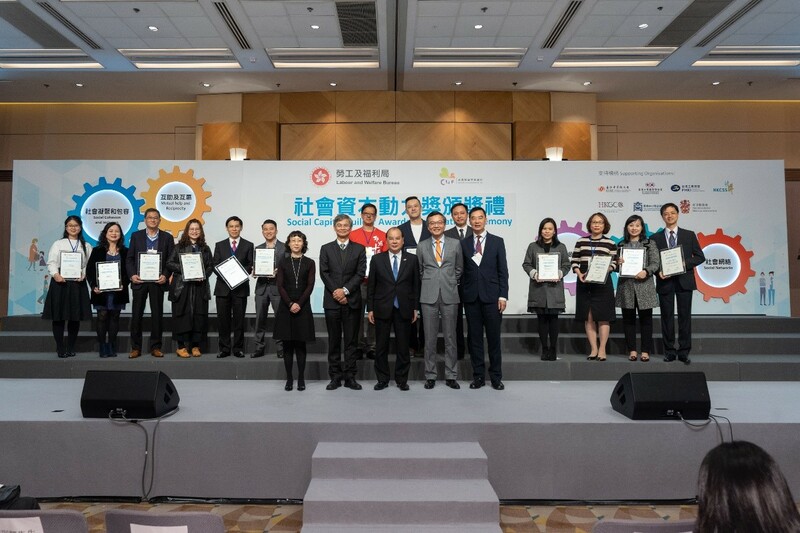 The CIIF Forum and SCB Awards Presentation Ceremony 2018 was successfully held on Tuesday, 18 December 2018 at the Hong Kong Convention and Exhibition Centre. The event attracted over 500 participants. We were pleased to have the Chinese General Chamber of Commerce, Chinese Manufacturers’ Association of Hong Kong, Federation of Hong Kong Industries, Hong Kong Council of Social Service, Hong Kong General Chamber of Commerce, Hong Kong General Chamber of Small and Medium Business, and the Hong Kong Medical Association as our supporting organisations for the CIIF biennial event this year. Featuring the theme “Social Capital as a Solution”, the Forum was kicked off by the Secretary for Labour and Welfare, Dr LAW Chi-kwong, GBS, JP. Dr LAW, together with the Chairman of the CIIF Committee, Dr LAM Ching-choi, and the Chief Executive of the Hong Kong Council of Social Service, Mr CHUA Hoi-wai, also attended as the speakers of the plenary session to explore with us how various sectors can jointly build up a better community. Apart from the plenary session, the whole-day event also comprised six concurrent sessions, with speakers from the CIIF Committee, SC.Net, and representatives from the social welfare, business, medical, education and academic sectors, etc. They shared their experience and explored with us various models of cross-sectoral collaboration. There was also an exhibition hosted by the volunteers from 17 CIIF-funded projects, who explained and showed to the participants the outcomes of social capital development projects. With the Chief Secretary for Administration, Mr Matthew CHEUNG Kin-chung, GBS, JP, as the officiating guest, the SCB Awards Presentation Ceremony was held as a finale of the Forum in recognition of the significant contributions of outstanding CIIF projects, partners and individuals to social capital building. Six projects have won the Outstanding Social Capital Project Awards, which is a two-fold jump compared with three winning projects in 2016. As for the SCB Logo Awards, 551 enterprises and organisations were presented with the Awards this year, with the number of winners growing by nearly 70% as compared with that in 2016. The remarkable increase in the number of awarded enterprises and organisations indicates once again that the concept and effectiveness of social capital have been increasingly recognised by various sectors of the community. CIIF would like to express its heartfelt gratitude to all participants, supporting organisations, speakers, moderators, facilitators, project teams, performance teams and volunteers for their active involvement and sterling support. Together we can contribute to the building of a caring community! Click here to download the programme information of the Forum. Click here to download the programme information of the SCB Awards Presentation Ceremony. The CIIF Forum 2018 was successfully held on 18 December 2018 at the Hong Kong Convention and Exhibition Centre. The event attracted over 500 participants. The Secretary for Labour and Welfare, Dr LAW Chi-kwong, delivers a speech at the Forum. SC.Net member, Mr Anderson Junior, and Ms Moon CHAN from the Hong Kong Federation of Women’s Centres are the MCs of the Forum. CIIF Committee members pose for photos at the Forum. Concurrent Session 5: Unleashing the Power of Social Capital. The Chief Secretary for Administration, Mr Matthew CHEUNG Kin-chung, speaks at the SCB Awards Presentation Ceremony. The Ceremony is kicked off with a puppet show by the Hong Kong Sheng Kung Hui Lady MacLehose Centre’s CIIF-funded “Love that Binds Social Capital Development Project”. The Chief Secretary for Administration, Mr Matthew CHEUNG kin-chung, joins the guided tour for the Project Expo before the Ceremony.